Aurorakim began on the Cobalt Ocean sometime in early May 2008 before moving to the Sage Ocean on 5/29/08. 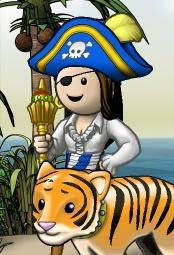 Although Aurorakim occasionally plays on all oceans and is a member of crews on several of them, her main home is Sage. Aurorakim started in the crew Sealords of Sage of the flag Imperial Rednecks, where she quickly learned how to be a successful pirate under the tutelage of Miget, who runs a very successful crew. She became a senior officer within a few months and was generally known for her fun pillaging and willingness to help and teach others. She left Sealords in early November 2008 and moved first to Seasirens of Sage when they left Imperial Rednecks to start their own flag As the Ship Sails and then on to her own crew, Just for Fun, which she started with 4 former Sealords mates. Their shared determination was that their piratey experience would indeed be "Just for Fun". JFF stayed with ASTS until late May 2010 before moving to the flag Midknight Sun where they currently reside. XO'ing Kimmy style: not usually any dull moments there. Some trivia is shared and some fun is had while she and her shipmates take on the monsters, the bots, and assorted blockade opponents. Bnaving Kimmy style. Anyone who's been to the Kimmy school of bnav knows that dyslexic moves and shooting lots of cannonballs that don't actually hit anything are part of the territory. Yet she always runs a darn successful pillage and even has a decent bnav stat. Go figure! Although Aurorakim normally doesn't pick on weaker ships, she did have a few oopsies with the Black Ship, most notably when finishing up a War Frig pillage and clicking the engage button when she shouldn't have. And then just a few weeks later during another big-boat pillage, doing the same thing (totally inadvertently!) with what turned out to be a smaller ship full of Sealords of Sage crew. What can you do when you get the black ship but just make the best of it and have fun, right? A hard lesson to learn, but one never forgotten. Blockading....yes blockading. Aurorakim and her flag tried and failed at Ventress Island in Fall 2009. They tried and failed at Albatross Island in Spring 2010. Then they tried and succeeded quite nicely at Wissahickon Island in June 2010. Aurorakim collects.....familiars (monkeys Sparkles & Sprinkles, and octo Private Inkster). She's currently on the quest to pull a snake from a CI chest. Merchanting....Aurorakim owns or manages a number of successful stalls/shoppes on various islands throughout Stork Archipelago, Gull Archipelago, Pelican Archipelago, and Ibis Archipelago. This page was last modified on 5 August 2010, at 04:23.